“When we began work on the 62 metre Maidelle (now Party Girl) it was with a fully custom approach,” says Rubelli’s head of design Alberto Pezzato. “We worked with Donghia and the interior designer Cristiano Gatto to create bespoke furniture in linen and silk and covered walls and ceilings in rare materials like parchment to complement the custom leather Venetian blinds we created.” The bespoke linen treatment comes with a price tag to match but if there’s one place you shouldn’t cut corners it’s in your suite. 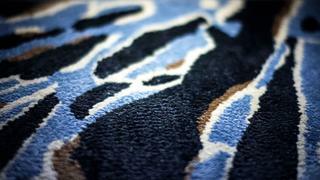 Rubelli’s opulent Katagami jacquard is a good place to start. 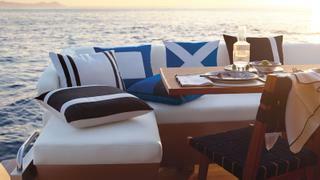 “A place’s identity is defined by fabrics and they reflect the lifestyle of a yacht’s inhabitants. Above all else, the choice of fabrics should be based on taste,” say Caterina and Raffaele Fabrizio, co-directors of fine Italian interiors brand Dedar. 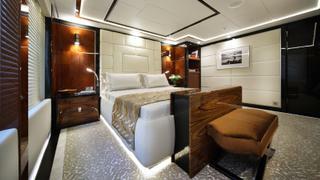 Perhaps nowhere is this more important than in the social heart of a superyacht: the main saloon. 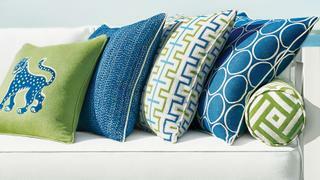 Fabrics here should imbue sophistication, warmth, comfort and hospitality. Try Dedar’s bold geometric Pachisi print for statement furniture or the discreetly luxurious Intarsiato for curtains and relax safe in the knowledge that all its fabrics are REACH certified for their low environmental impact during manufacture. Choosing fabrics for more formal entertaining areas such as the upper aft deck requires designers to tread a fine line between practicality and style. Fabrics must stand up to the the elements while retaining elegance but this, say Arnaud Dalle and Melanie Bernard, is why Sunbrella fabrics are ideal. 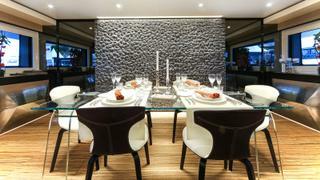 “Now, more than ever, the marine market is creatively playing with interior design codes. We believe outdoor spaces should be treated as an extension of inside and carry the same design ethos, which is why all our fabrics are fade and stain resistant. You can spill red wine, chocolate or juice on them and they will wash off like new.” Put them to the test with the subtly nautical Riviera collection. Regarded as a notoriously tricky space among yacht interior designers, carpets and linens for dining areas must be luxurious enough to create the atmosphere of a fine restaurant while robust enough to combat the trials of wine spillages, sticky sauces and constant laundering. Gentili Mosconi, the Italian textiles firm tasked with outfitting the Wider 150 (pictured), masters this balance with a range of bespoke fabrics that are both stain and salt-spray proof. The main aft deck is where your yacht makes its first impression so choosing fabrics with a little personality is key – especially if you’re in the charter market. However, as an outdoor space often used for casual entertaining, there are also practical considerations to take into account. 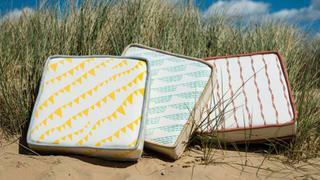 Thibaut’s Sunbrella fabrics undergo all the rigorous testing of the maker’s own fabrics but are available in a range of exclusive designs and patterns. Contrast upholstery and cushion fabrics from the recently launched highly patterned Calypso and Portico collections to leave a lasting impression. Outdoor fabrics aren’t just about cushions and upholstery and, while teak flooring may be standard, if you want to break from tradition look to luxury carpet specialist Tai Ping. “Keep in mind what each area of your yacht is used for,” advises managing director Xavier Bonamy. 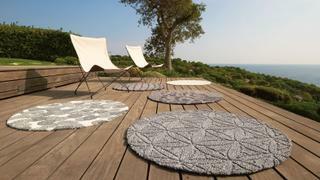 “High-traffic or environmentally challenging areas affect how long a carpet lasts, which is why we designed a yarn specifically for outdoor use.” Choose the intricately patterned Surya for a beach club with character or the understated Calligram for a more subtle look. If you want to impress guests or charter clients with the quality of your cabin linens but aren’t keen to go to the full expense of bespoke, choosing fabrics from a recognisable brand renowned for its excellence in the field is a great alternative. Italian brand Loro Piana may be best known for its technical sailing gear and luxurious vicuña knitwear but it also does a brilliant line in natural fabrics developed specifically for yachts. 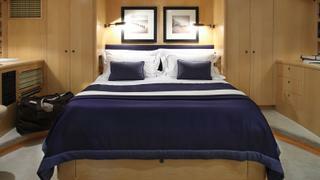 Choose cool, crisp white linen bed sheets and contrast with navy cashmere cushions for a quintessentially naval look. For areas of your yacht used more sporadically, you can afford to go to town with some seriously luxurious finishings. Take, for example, your on board cinema. Bonus rooms such as this should emit an air of true opulence but, says Sabrina Valsecchi of C&C Milano, the firm that outfitted the recently delivered Mangusta 165 Da Vinci, the design and aesthetic of a fabric should fit naturally with its surroundings. So what would she choose for an on board cinema? The aptly named velvet Riva in deepest, chicest navy. “Choosing a carpet for a yacht is like choosing a dress for a beautiful woman,” says Marta Cortesani, international project manager at Chi Design. “Every detail must enhance her appearance, not cover it, and should be part of the environment without dominating it.” This, adds Cortesani, is imperative in high-traffic areas such as stairwells and foyers, where the owner’s personality should shine through but carpets must be easy for crew to keep clean. She recommends a wool loop pile carpet in a gently graduating colour scheme.